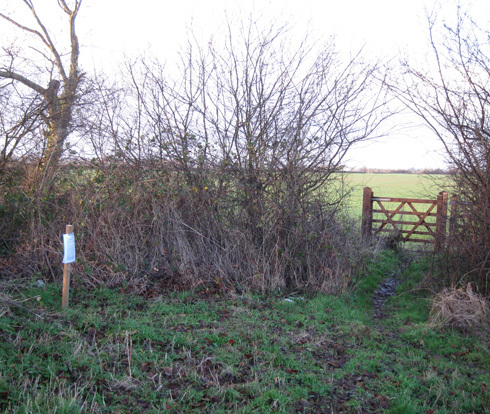 This new gate has recently been erected on the footpath between Sulgrave and Thorpe Mandeville. The notice on the post states that the construction of the high speed railway will require the stopping up or diversion of the footpath! The Department for Transport has announced that: “…the deadline for responding to the consultation on the Environmental Statement for Phase One of the high speed rail project is extended to midnight on 27th February 2014”. See here for extracts from the statement relative to Sulgrave and here for how to make representations. HS2 still seems a few years away but it’s important to understand the impact on this area, not just when it’s completed but during the construction phase. Buried in the 55,000 page HS2 Environmental Statement are chilling forecasts for residents of Brackley and its surrounds should the proposed HS2 high speed rail link go ahead as planned. Beginning in 2017, a site a few hundred yards up the A422 Buckingham Road from Brackley will ‘have an associated roadhead for the receipt, storage and transfer of earthworks material route-wide’. The site will be used for 3 years but for 17months of peak activity, the average daily number of HGV trips to and from the site will be 1700 to 2,860. That’s 6 per minute or one every 10 seconds, practically nose to tail, and it’s only an average. It will be like taking the A43 down to one lane as the other will be used by the HGVs. It appears many lorries will come from J10 of the M40 which is forecast for ‘significant increases in congestion and significant delays’, as are the A43 junction with the B4100 (causing delays for Bicester Station commuters), the A43 Tesco roundabout junction and the A43 Buckingham Road junction. Regular travellers to Oxford had better find another route. These figures are in addition to trucks serving other construction compounds such as the main one in the area on the A43 just North of the Brackley BP roundabout which will handle building the Turweston Viaduct and shifting the A43 eighty or so metres to the North to go over the new railway. It will be in existence for five and a half years and provide accommodation for 100 – 200 workers and be the centre for all the civil engineering and rail installation works in the area. On top of this will be construction traffic for other projects such as the Radstone Fields housing development. Other construction compounds described in the report have a fraction of this traffic. Northolt, which is the start of the major tunnel into London, has less. Only in the Birmingham area (Coleshill Junction) where the spur to the city comes to and fro from the main line, will construction traffic be higher but it will be managed from dedicated roadheads and railheads. Brackley residents are being hit in three ways. They will suffer the scar and noise of HS2 in their locality for the foreseeable future; households will be paying an average of £2,500 – £3,000 out of their taxes to pay for it; they will be hit by years of traffic congestion during construction. But most of them will never use the line. The nearest station is at Birmingham. Worse still, local services are likely to be cut resulting in fewer trains to London from places like Bicester as HS2 takes the longer route travellers. This entry was posted on Saturday, February 15th, 2014 at 5:18 pm	and is filed under News. You can follow any responses to this entry through the RSS 2.0 feed. You can leave a response, or trackback from your own site.